Law school finals are coming... it is time to prepare for the onslaught of outlines, notecards and practice essays. 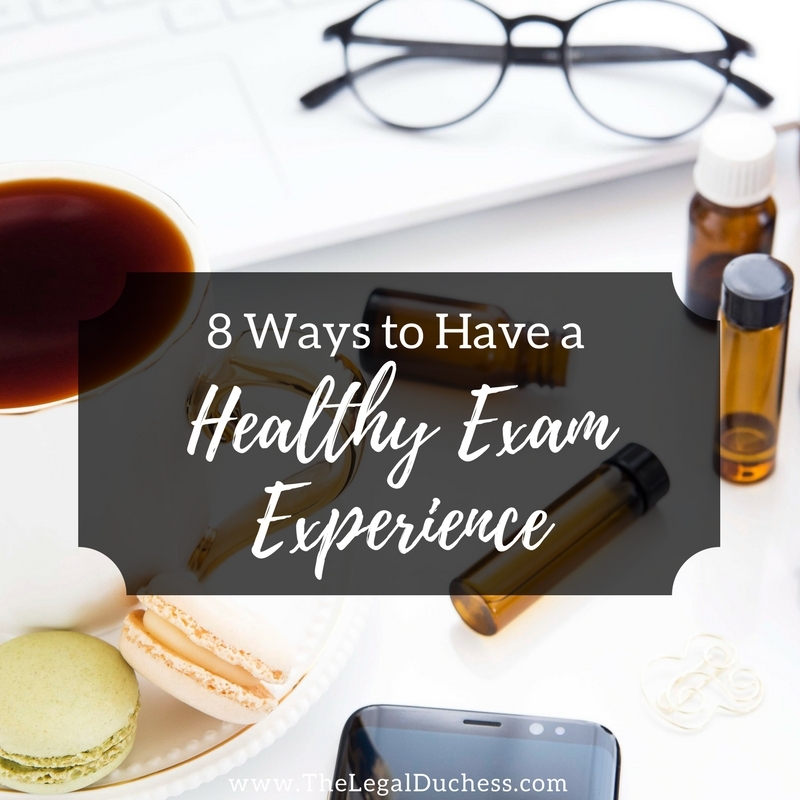 I have compiled a list of some of my best tips for staying healthy throughout final exams.... exams are super important but they are not worth sacrificing your health and wellness. I spent a good part of this weekend making myself some healthy snack packs and prepped some healthy dinners. I made baggies of carrots, celery, apple slices, crackers, pretzels, and blueberries. I love having them ready and bagged in my fridge so I can just grab a healthy snack on the go and avoid the temptation of a handful of Pringles or cookies. For healthy dinners, I like having ingredients on hand for some easy dinners in the heat of finals week. A few of my favorites are chicken and rice casserole (only 4 ingredients! ), tacos, grilled chicken salad, tuna salad sandwichs and shepherds pie. I always have broccoli and green beans for sides. I would rather make something quickly at home with healthy ingredients than stop and pick up fast food. As one of my professors recently said, eating crappy food makes you feel crappy so eat healthy and fuel yourself the right way! Having healthy food ready on hand is the simplest way to do this. During finals, especially as a 1L, it is very easy to psych yourself out and let the stress get the best of you. You have to right to stay right mentally. Take breaks, go for a run, take a bubble bath, have a good cry... whatever you need to do. Final exams is as much an endurance challenge as it is an academic challenge- take care of yourself and your mind so that you can make it to the finish line. Exercise is a great way to stay feeling healthy and energized. I enjoy a yoga session or a short run during finals as a mental break. As the great Elle Woods said, exercise gives you endorphins and endorphins make you happy! You need to be happy during finals so do whatever you need to. You can even take your books or outlines to the gym and read while you ride the stationary bike. It is tempting to pull all-nighters and skimp on sleep during the heat of finals. As much as that extra hour of studying seems appealing, the extra sleep will do you much better in the long run. Getting a normal amount of sleep during finals will help you so much. Your brain cannot process information when it is overtired so your studying will be far more effective if you are rested. Also, 2 weeks of little sleep will make you a walking zombie... don't let it get to that. Manage your time and plan for 5-6 hours of sleep each night minimum. Studying involves staring at papers, books, and computers for outrageous amounts of time... this is very hard on the eyes- especially if you already have poor eyesight and wear glasses or contacts. I generally wear contacts and I have found that blue light blocking glasses help immensely when studying for long period of time. Also, I keep eye drops in my bookbag for long study sessions because my eyes inevitably get dry. I also alternate between contacts and glasses to keep my eyes from getting to dried out by my contacts. Keep your eyes feeling good so you can keep staring at the books! Law school exams are stressful, there is no denying that. But de-tressing should be done in healthy ways... basically don't drink away your problems. It will not help. Exercise or go to the park... find a healthy way to get rid of your excess stress and don't let it take over your life. I usually bake cookies, clean my house or take a bubble bath when I need to de-stress. Drinking away your stress will only lead to problems. You need people to lean on during finals. Spend time with the people who support you: family, friends, significant others, study groups. Avoid negative influences in your life. Find a study group that is productive or study alone if that works for you. Call your mom when you need to talk to someone. Have dinner with your significant other as a study break. Cuddle with your pet while reviewing notecards. Let your support system support you during this stressful time. I find that removing social media app's from my phone during finals is a great way to cut out all that drama and distraction from my life. the important people in my life will text or call so I am not missing out on anything important. I am not sad about missing out on a Christmas party to study if I don't see the snapchats of it and I am not tempted to scroll through Instagram for 30 minutes if the app isn't on my phone. As soon as finals are over, I re-download but for two weeks, life is just fine without social media. Best of luck!! Go crush those exams!